I am so very excited to be a stop on the blog tour for Amy Barickman's new book Fabric Flowers, I had the pleasure to receive the book and give a couple of flowers a try, it's pretty hard to pick because the book has 25 beautiful flowers with the patterns and detailed instructions. I am a fabric flower lover so I was thrilled to be asked to participate, the flower I am going to show you is the lily bloom, I added my own spin and changed the center of the flower, hand stitched the edges and add some leafs =] I am super excited about how it came out. Since I still have not finish my sewing room, I though this would make the perfect wall accent, I added my new flower with my rose flower and my daisy in a embroidery hoop, and TA-DA! a cute and very pink accent for my wall is ready. So here is your chance to win Amy's new book and Kanzashi Tools from Clover to whip up your own fab floral accessories! Simply comment sharing a project you would like to add flowers to or what you'd like to make with fabric flowers and the most original idea will be the winner, so be creative =] The winner will be chosen March 7th! 2/28/13 – How Joyful – This is ME! So there you go! good luck and have a lovely day! Omgoodness that is a pretty flower. I love that you added that sparkle at the center of it. It is quite lovely! WOW! I love the idea of putting the flowers on a background and then into a wooden hoop. I used to do embroidery and put in a hoop…but this is even cuter. I hope to try it soon. Thanks for the idea. I love the stitching around the outside, it gives is a little something extra. This is amazing!! I am working on ideas for the flowers for my wedding this September. I have made a few but this book would really help me finish this ambitious project!! 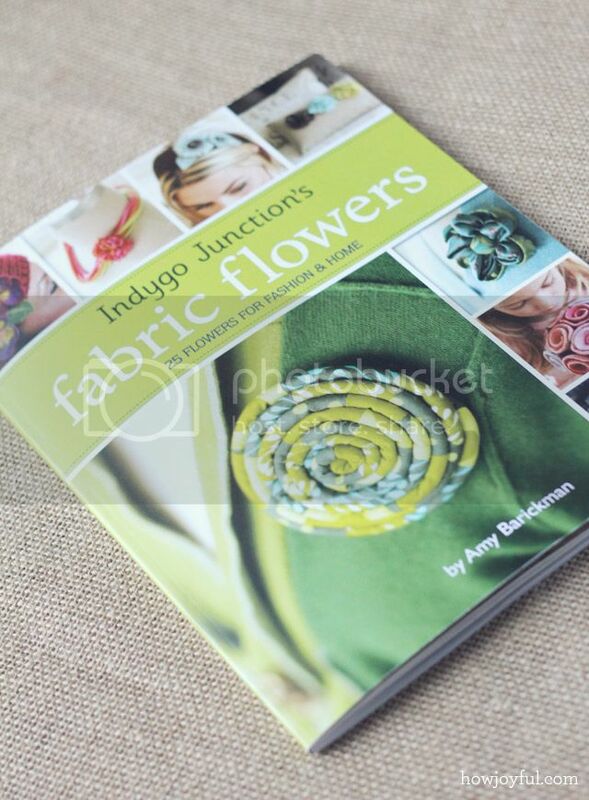 I’ve made fabric flowers a few different ways, but I’m always searching for new ideas, this book looks great! 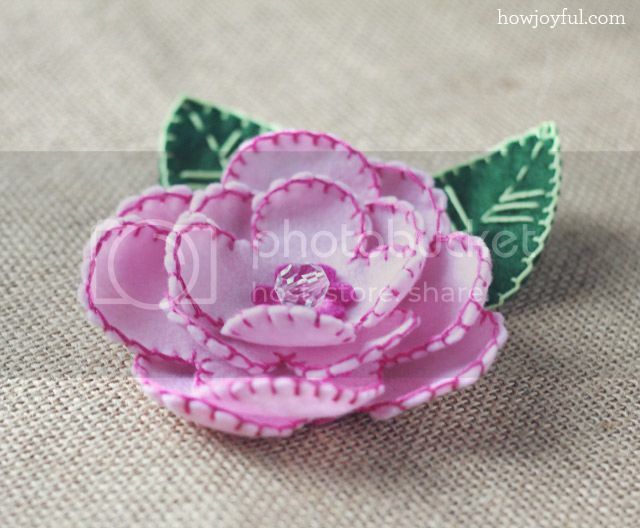 I want to make some flowers to wear as hair accessories or dress up a headband. flores para los vestidos de mi nena, como prendedores, adornos para el cabello, etc infinidad de proyectos! gracias por la oportunidad de participar Joy! I think I would like to make the flowers to decorate the valences on the windows in my daughter’s bedroom (a row across the bottom or a cluster in each corner. I love your additions. Many thanks for the chance! Put it on a headband for the cuteest 5 mo. old princess for her Easter Bonnet! This flower with your embellishments would look cut in my granddaughters hair! Can’ t wait towin the book! Cute not cut. Sorry my fingers don’t type as fast as my mind. A flower-gram! I think it would be fun to incorporate words into the petals to send along a message of love or good cheer to someone! What a lovely book! I actually don’t want to add them to anything, I’d like to make a bouquet! My cat licks real flowers, eats plastic flowers, so I want to try fabric flowers next! Great flowers! A wall with hoops of flowers would look awesome!! What a beutiful Wall decor piece Joy! The flowers are absolutely adorable, thank you for aharing! Well I just noticed I forgot to add my idea: I LOVE,LOVE,LOVE simple yet comfortable elastic belts. I have come to adore the new lines of elastic bands sold at Joann’s. Regularly I use plain metal buckles for ease, especially when it is for a young child, but now a fabric flower will ve the perfect cover up, ahem…stylish accent to hide the unsightly metal buckle. Once again, Thank you for the chance to win! Your flowers are beautiful….with neat stitching, and color choice. Makes me want to sit down and make some flowers, too!! I loved with you did with the flower and it looked so cute with the other 2 flowers. That would be a fun “granddaughter” project when they come to visit. 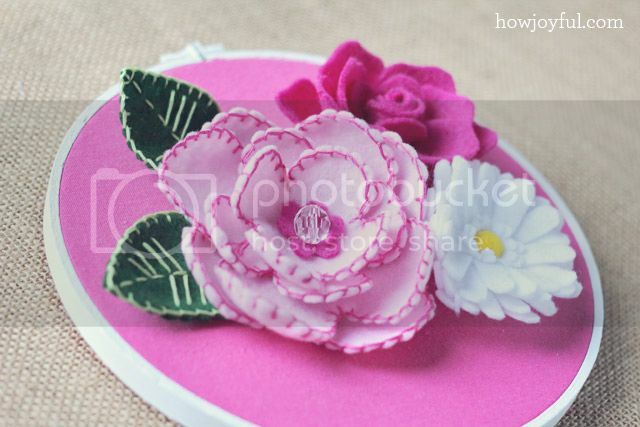 Your rose flower/daisy is gorgeous and I love your idea of putting it on embroidery hoop. Thank you for the opportunity to win. Hmm where would I put flowers, you mean aside from everywhere? Haha. When I was in high school I painted a canvas to use as a headboard and one week after I had it painted just as I wanted for some reason I started making felt flowers and gluing them on the headboard. 10 years later I am still not done but I still get in a flower making frenzy every now and then and add to it, even though I don’t sleep there anymore and its just a half-flower covered canvas now. So I would put flowers there to finish making my plush flowered canvas headboard! I think the baby girl I’m expecting this summer may need a few flowers for her hair! I’d likek to make a zipper pouch with some fabric flowers on it. I love your hoop, so sweet! I would like to make a bunch of fabric flowers to go in a vase. Not sure what I would use as stems, would have to be wire wrapped in fabric I guess? Or they could be tied in s bunch with ribbon instead of in a vase and hung on the wall, I think that would be cute! I want to make pillows and embellish them in flowers to coordinate with the different rooms in my home. I would love to put some flowers on the fabric storage totes I am making! They would look so cute on the shelves of my sewing room! I would add flowers to a purse. I am making a spring banner that would look lovely with some flowers on it! 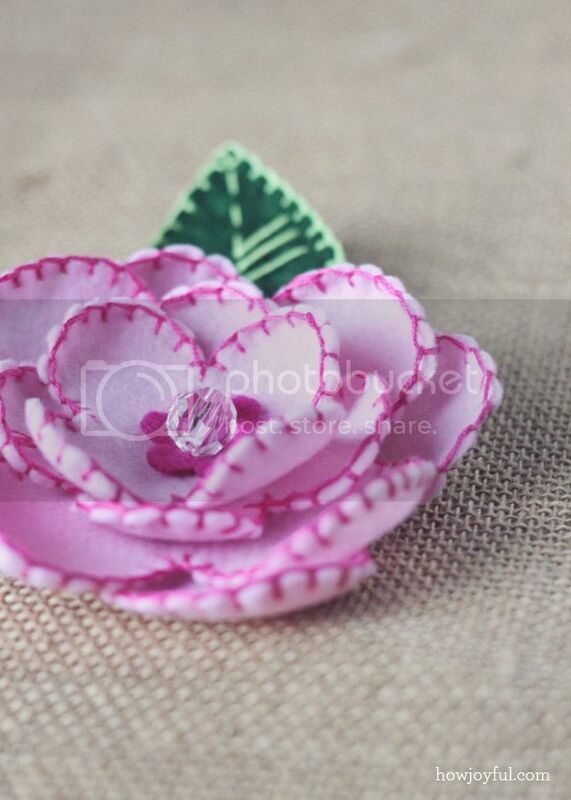 I would love to make these fabric flowers and sew some to my little girls shoes! I would like to decorate my filing cabinet at work. It’s that ugly “tan” that was so common in the 80’s. I have a flat side (no drawers) turned towards me in my office so I think it would look great to create a couple lines of fabric flowers flowing down the side. Awesome… I would use them for hair accessories…. Totally cute! I would love to win this fun book on making flowers. With four grand daughters I use lots of flower embellishments. Always looking for new ideas for recycling too. The teaser pictures make me want to run out and buy it asap. I would like to add flowers to a skirt. I am restoring an old bassinet for the dolls of my daughter. Flowers would add a lovely and poetic touch to the sheets and blanket I would like to create to garnish the bassinet. Thanks! I would love this book ! I love putting flowers on skirts and dresses. I need new ideas and this looks great! Thanks for the chance. How pretty! I am not a super girlie girl but these flowers are gorgeous! I would love to make some hair clips for all of the ladies in my family. Hats! I would love to jazz up my winter hats esp. now with the 20 inches of snow on the ground. I could use these fabric flowers on my handbags! We are going to be adding an IKEA bookcase to our living room. I would love to add some color to it by putting these flowers in it. i think that flower would be SOOO cute on a clutch! Thanks for the giveaway! I am a HUGE fan of fabric flowers. I put them on all the girls sundresses and headbands I am making. I love what you did! so unique. I would give the book to my friend. She makes personalized hangers with wires. If she had the book she can make flowers to add onto the hanger. It would be so cute for little girls hangers. I love this book it is just the neatest book on flowers to make I’ve ever seen. Sure hope I win one otherwise I guess I have to buy one. I want to make a wall hanging for my granddaughter in her favorite colors of pink and purple with spring green and yellow….a few felt butterflies and she would adore this! She would also have to have some for her hair and purse too. I love the fabric flowers. I will make a hairband and embellished with it. After almost two feet of snow in the last week, I am dreaming of making brightly colored flowers to adorn a pair of flip flops! I’d like to make a wreath of fabric flowers for my front door. I’d like to make a wreath of fabric flowers for on my front door. Hi Joy wow what a fabulous book to add to your sewing collection. I can see them added to quilts, bags, purses, allot. The project I am doing now is changing my sewing room to gray and pink…I am making a sign for my door that says “Amore” and would love to make the flower that you are showing to add just a little extra to the corner of the sign…..thanks for sharing this. My yoga mat cover is just screaming for some flower power. I would add some a few felt flowers at the top opening and enjoy the compliments I’m sure to get! I’d love to learn to make more fabric flowers so I can use it to spruce up some plain looking lampshades and also use it to make a cute hair tie/bow holder for my daughter! I would love to put a bunch on my summer bucket hat! I love them all.I will use the daisys to cover up my wedding picture’s frame. Because we used daisys theme in our wedding(invitations,cake,my dress…)and plus I love daisys which makes me happy when I just look them.Thank you for sharing us those lovely tutorials. 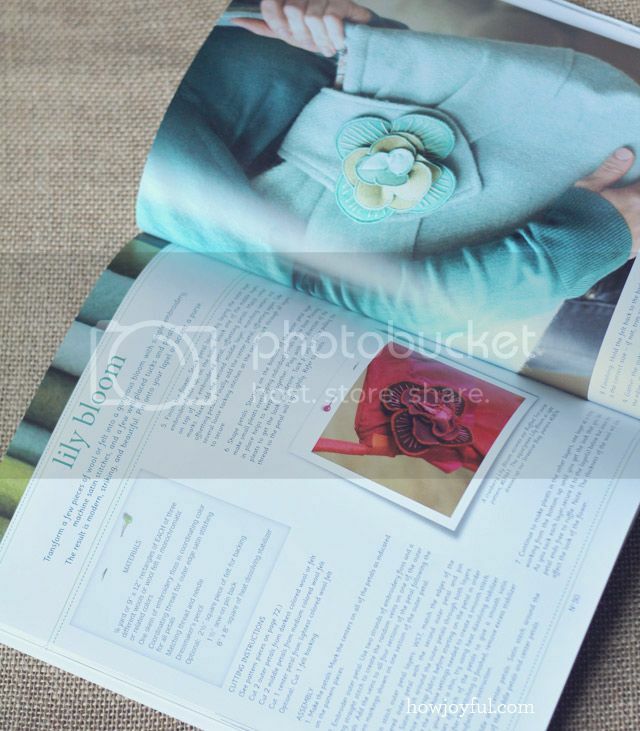 l will love to win the book and add flowers to a mirror in my bedroom, I think it would look so lovely! 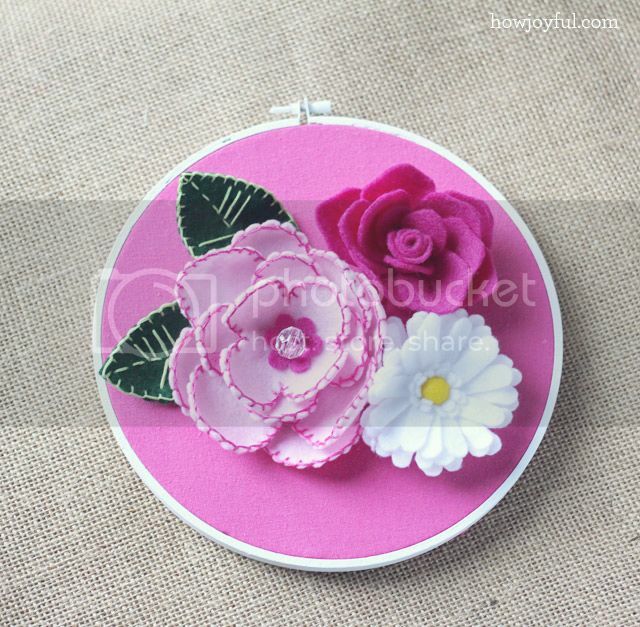 I loved the idea of the embroidery hoop, you are so awesome! I love fabric flowers and enjoy putting them on my jewlery and on quilts. Your flowers and sdaptations to original patterns are gorgeous. Thank you for the chance for the giveaway. My ideas are to use the patterns for my wedding – not too original, but my ideas are 1. to have my crafty friends actually each make a flower for my bouquet so it is a bunch of memories of those friends 2. as the centerpieces and instead of real flowers for the wedding party so everyone has a hand made memento 3. I have an art wall design based upon http://thingsbright.com/bright-things-anu-tuominens-crochet-potholder-installation/ where I will use crocheted pot holders for a tree and paint a trunk on the wall for our new house & want to add a flower garden beneath made from crafted flowers from this book and other sources. I want to make beautiful headbands for little girls.. these flowers will be perfect! I’d like to make the one you made, it’s beautiful! I would like to create a garland of fabric flowers to hang around my ceiling or the four posters of a bed.